In 1978, Jonathan Raban flew to the Arab world, visiting seven countries at the periphery of the Arabian Peninsula in the time of about three months. His initial interest was triggered by the influx of Arabs into London in the late 70s and nurtured by the curious traits and patterns he observed in his neighborhood, around Earl's Court Road. In the time it took him – a considerable project in itself – to secure visas to the countries he had put on his itinerary (minus Saudi Arabia, which stonewalled his requests), he picked up Arabic writing and reading and then some rudimentary understanding of the Arabic language. Both would prove priceless on his trip, which resulted in a fairly entertaining book. The book starts, in its introductory chapter, with on of the most concise descriptions of the basic concepts of the Arabic language that I know. It boils down to word roots and ambiguity of meaning, and is worth understanding. Raban has mastered this, but he has no illusions about his level of proficiency: "As a conversational instrument, my Arabic is useless. I am limited to greetings, street directions, words for food and thank-yous. Yet the Wehr Dictionary, and the comprehension of the alphabet, seemed to shed far more light on the Arabs I saw in London than either Thesiger, Lawrence or the Koran." I could say exactly the same for myself – the Wehr is still the standard thirty years on, though I haven't acquired one yet – and must encourage any traveler to the Arab world to pick up some basic Arabic – handwriting, the idea of roots, simple concepts. It is truly eye-opening, and much easier than commonly thought. From the very beginning, writing a book was the motivation behind traveling. Raban would journey through lands that have been copiously written about (by Wilfred Thesiger, Lawrence of Arabia and Freya Stark most famously) and debunk some of the myths that have become entrenched over time. The attachment of the rural poor to their simple lifestyle was one. The intrinsic heroism of pre-Western societies was another. Raban set out to write a thoroughly modern account of contemporary Arabic life, and he refuses to be held hostage by earlier travel writing or by the romantic views of British Orientalism. Nevertheless, and in spite of all the best intentions, the book is defined mostly by its historic context. The 1973 war between Israel on the one side and Egypt and Syria on the other was already far enough in the past to not weigh on every thought and conversation. The massacres of Palestinians in the refugee camps of Sabra and Shatila and the Israeli invasion of Lebanon and subsequent bombing of Beirut were still a few years off. In the middle of this, the first global oil crisis had brought European and American economies to their knees and made the fortunes of oil-producing countries, especially in the Gulf. They found themselves, head-over-heels and through no doing of their own, in the epicenter of a major economic boom that shook the traditional way of life in its foundations. The countries were giddy with prospects and innocently afraid of losing themselves. It was time of bubbly optimism and happy/anxious anything goes. Arabs quite clearly seemed to have their fortunes in their own hands, and they were running with them. The sentiment of change, sometimes with nauseating intensity, is nicely captured in the four chapters on Bahrein and the Gulf emirates of Qatar, Abu Dhabi and Dubai. Striking for the reader of today is the description of Dubai as the most down-to-earth and quietly self-assured of the four. What is also surprising is that the overall makeup of society wasn't much different thirty years ago from what it is now. Wealth seems ubiquitous if you move in the right circles but is forever out of reach if you don't. Thirty years ago, the gap between the citizens and Western expatriates on one side and cheap imported labor on the other was already a defining feature of Gulf societies. Pakistanis, Baluchis and Indians (and South Koreans back then) turned oil money into hotels, apartment blocks, private gardens, roads, factories, refineries, and new docks and wharfs. They watered artificial oases in the desert, unloaded goods in the depth of the night and stood by for any services that might be required. Thus they formed the backbone of a society that was ready, at a whim, to expel them from the country and send them packing. Raban tries to cross the boundary between rich/Western and poor and illuminate both sides of the economic miracle but usually gets stuck in his bushwhacking expeditions before reaching rarely seen and interesting sites. Thanks to perspicacious observations and engaged writing, the chapters on the Gulf states make for pleasant enough reading but they're short of satisfying. This changes when the trip continues to Yemen and Egypt. Yemen is memorable for showing an unimaginable world of madness, a world of concurrent development and decay, and of hope and despair in the same people and at the same time. Raban's initial assessment is that "No one should catch their first sight of the Yemen before breakfast: it brings on vertigo and an alarming conviction that one must be suffering from some extreme disorder of one's vision." The following pages do their best to substantiate this judgment with observations and facts. This is done with much inspiration but without any mean spirit. In Sana'a, the capital of Yemen, dust comes into its own for the first time. The city appeared to be crumbling before Raban's eyes. He writes, "If all enterprise in Europe had stopped dead in the middle of the Renaissance, and the whole edifice of civilization been left to quietly self-destruct, then London, Florence, Venice, Chartres and Amsterdam would look today much like my first impression of Sana'a." It was at this point that I thought I saw a connection to my own trip to Jordan for the first time. It was late afternoon one day after visiting the vast area of Roman ruins just next door. 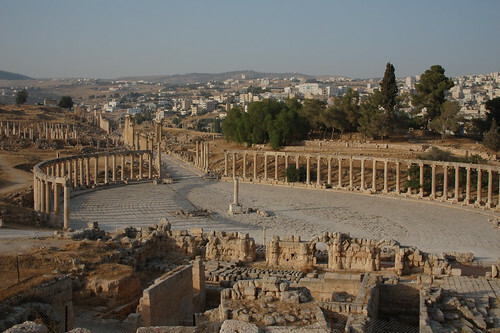 I strolled through modern-day Jerash, searching for a tea house that would let me watch the World Cup game that had just started. With every step I took, I kicked up the dust that the town was heavy with. As my lung slowly filled with warm powder, I remembered a friend who had once declared that the only honest tagline to advertise Jordan would be "The finest dust on earth". That evening in Jerash, I saw no reason to argue. As I walked by decapitated goats sluggishly dangling in the breeze of powdery sand that hung in the air, I realized that I wasn't in just another god-forsaken place decaying into a mystic netherworld. The shop fronts on both sides were bright windows in crumbling walls, but the bulk of the dust came from a complete municipal infrastructure upgrade that the city was undergoing. The blacktop had been stripped from streets and sidewalks, optimistically and entirely, as if just starting the project would ensure its completion. But the new surface was nowhere in sight yet, and what remained of the foundations of the streets was disintegrating. Half an hour into my walk, the sunset prayer ended and crowds spilled into the streets, kicking up even more dust. The fruit vendors took the opportunity to flog their wares right at the main gate of the mosque. Noisy little cars honked their way through the madness. By now, the oppressive heat of the day had subsided, but the dust was deathly dehydrating. Settling on clothes and skin, on the tongue and in the lung, it was a real killer – and it made Raban's descriptions of car dodging and old-town expeditions in Sana'a come to life, though otherwise the Yemen has not much in common with Jordan. The search for a tea house did eventually prove futile. Driving back to my friend's house, I was manically scanning the frequencies on the car stereo to find a station that would broadcast the game live. There was nothing. Instead, I was treated to the news, read in English on Radio Jordan, and experienced a feature of Arabic culture that has prevailed since ancient times. "His Royal Highness Prince Faisal received the Pakistani Air Force Chief and a delegation for talks concerning cooperation in military fields", claimed the first item. Brilliant clouds of hot air such as this are apparently de-rigueur in Arabic countries, where the press is not free as we understand it and where the status of the printed word (and by extension the radio and TV news) is different from that which we accord it. Raban noted that for a devout Muslim "ideas of 'the book' and 'the Koran' were indissoluble. Written language for him meant the language of scripture. It meant the revealed truth of God, and the printed words were there as objects of mystical contemplation. […] the news on television, like the newspapers, told the Truth about events by avoiding any description of them." It was for this reason that Raban's idea to write a book was greeted with much suspicion. Many acquaintances he made on his trip just shook their heads when they heard of his intentions. The Saudi authorities did one better: They wouldn't even let him into the country. My favorite reaction came from Raban's Arabic teacher in London who cautioned that haktab kitab (I will write a book.) can also mean I'm getting married (as in: I'm signing the contract of marriage). Raban didn't get married, but he wrote his book as planned. It ends with the author's return home. What hit him most, on his drive back from the airport, was "the silence of London. The roll of traffic down the M4 from Heathrow seemed like a funeral cortège after the hooting din of every Arab city. There was a sleepy placidity in the way we shifted lanes all the way along the Cromwell Road, without a single horn being sounded. Home was a grave, staid place." I finished reading the book as the plane from Amman descended into Heathrow. On the tube ride to West Kensington, I found myself living the last pages of the book. Boring civility and the complete lack of the extraordinary soothed my nerves. Plus, it was raining – slowly, unimaginatively, in a very English way. When the doors opened at Osterley, a whiff of wet air and fresh grass entered the carriage, leaving everyone else untouched but wiping from my mind any remnants of desert dust that might still have laid there. Enormous was the contrast between where I had come from and where I was going. Some say that traveling is dead, that all is the same and true adventures cannot be had anymore. They say that all has been explored and the exotic is just an extension of the familiar, with most differences in the world homogenized by the flattening forces of globalization. They say that today's travelers are merely tourists. This is emphatically not the case. With instant communication and jet travel, the world might feel smaller. But it's still a big place, full of curiosities and oddities, outrageous and mind-blowing. I've just returned from a friend's wedding, enjoying the comfort of an instant and wholly undeserved family connection, but had I been a bit more adventurous, I could have traveled much like Raban described it more than thirty years ago. His book serves as a potent reminded that time doesn't kill traveling. Go out and explore!